This free course is for first-time expectant parents. It’s an early intervention health promotion course that helps couples move from having just two members in their family, to three or more. If you are introducing your first baby into your family this course assists you to prepare yourself for a smooth transition to family life. I have learned how our history shapes being a parent and that impacts on our relationship and how important it is that we support each other and turn towards each other when we are tired and challenged. 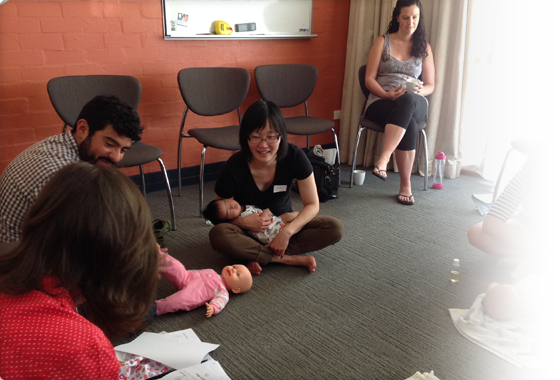 The course helps parents ease into parenthood—a new and important, but sometimes challenging, phase of their lives. provide help on where to find support. My wife and I attended the Relaxing into Parenting Program. I would just like to say I am very, very impressed with everything Liz, Vidky and Toni did. As a guy I didn’t really want to come to the course, I said to my “you go, I will be bored”. But, I really, really loved it and I looked forward to the next session every week. Even when we had a long session on Saturday it went so fast, because we were enjoying it and we learned a lot from that course. Once again thanks a lot to all of you for your fantastic work, keep it up. Helps you know when and where to get help when needed. This program is conducted in a primary health care setting, using a community development approach. Groups are conducted 5 times a year in February, April, June/July, September and November. You will be allocated to a group with other participants who have babies due around the same time. You can register by completing this Intake assessment form.